HUNDREDS of children from five schools in and around Henley took part in a skills workshop at the town’s rugby club. 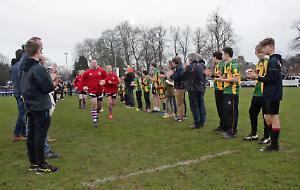 The year one and two pupils from Sacred Heart and Trinity schools in Henley, as well as Nettlebed, Shiplake and Peppard, spent the morning at Henley Rugby Club’s “tiger turf” pitch on Wednesday of last week, where they were taught skills by coaches from Performance Sport and played mini-games. It is part of the Player Reach-Out Programme, or PROP, between the company, the club and the schools to teach the sport to children in the town. The coaches have been visiting the schools over the past month, culminating in the event at the club, where they learnt more about the rules of the game, how to pass and score and “tag” opponents, a non-contact version of tackling where they pull a coloured tag off another player’s kit. The older pupils also took part in a tournament, where they were organised in to four leagues of three and played short games against each other. The main tournament was won by the Titans team from Trinity, while Shiplake Stars won the runners-up contest. Coach Andrew Clarke said: “The aim is to drive people to the club and promote what we are doing as a club and a company. “It’s a wonderful facility and a great morning with the sun out to promote rugby in the area. “We had a skills session in the morning where we went through tagging, warm-ups and running around learning the game and technique. It’s what we’ve been doing in the schools up until now. “We then organised them in to teams, with the year twos having a tournament and year one doing skills. “It’s a new environment for them to meet new people and doing something they might not have done much of before. “They might have a passion and ability for rugby. We’ve seen kids leaving with smiles on their faces, having enjoyed it.